Doctor Who has produced its fair share of memorable episodes and moments in its long history, but few have had such a lasting and powerful impact as ‘Earthshock.’ The Doctor and his companions court danger in every adventure, and yet an assumed and unwritten rule is that the heroes always escape alive and more or less intact. There may be some bruises or shock that warrant reflection upon the way, but the Doctor is a safety net in a family programme who protects those he takes aboard. ‘Earthshock’ breaks that rule, however, and for the first time since Katarina and Sara Kingdom- neither of whom can be classified as a true companion due to the brevity of their inclusion- in the Hartnell era, a companion suffers the ultimate fate. A three-companion TARDIS with a dynamic young Doctor was always going to be problematic, especially when Davison proved so quickly that he could step out of Tom Baker’s sizable shadow and make the role his own. In retrospect, it’s probably unsurprising that Matthew Waterhouse’s Adric would be the companion to go, Waterhouse having been on the show the longest despite his inexperience that sometimes showed but also because of Adric’s personality that shared distinct components with those of both Nyssa and Tegan. In a season that has proved time and again that the scripts can’t quite juggle such a large roster without essentially sidelining one of the companions, Nyssa being the victim here, losing a companion also makes sense on a practical level as well. Fortunately, this send-off story for Adric highlights his character’s positive and negative attributes perfectly, unafraid of bringing his petulance and haughtiness to the forefront as he tries to earn the respect of his peers and truly find his place within his surrogate family. Yet although the Doctor and Adric dynamic works to great effect in ‘Earthshock,’ the actual story itself is somewhat mixed in its execution. On a very positive note, even though the first episode feels somewhat disjointed from the remaining three, the tension and atmosphere created within the caverns as the Doctor finds himself unable to instantly ingratiate himself with a team of explorers as killer androids loom and a remote-controlled bomb ticks down is superb. However, once the action shifts to the freighter once the Cybermen are revealed to be the true menace, the pacing and intrigue decrease substantially as the expanded cast of guest characters and foes are hardly given any time to develop. The duality of the Cybermen’s plot to destroy and/or invade Earth depending on viewpoints is somewhat muddled, and the script does little to portray the Cybermen as anything more than just robots, bypassing the horrific aspect of humanity and the lack of emotions so crucial to their very existence. ‘Earthshock’ does manage to draw on the iconicity of the classic foes rather successfully in a visual sense, but there is little to distinguish them from a more generic threat. 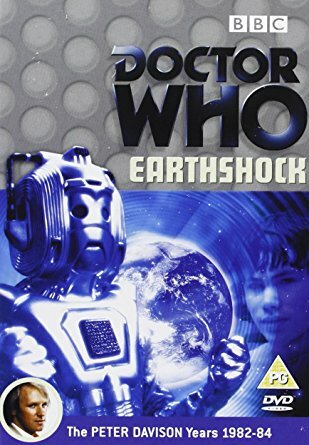 Of course, one of the other lasting moments of ‘Earthshock’ is the fact that the Cybermen and the crashed freighter are responsible for the extinction of the dinosaurs. Admittedly, this is a nice subversion of expectations even if the time travel elements comes rather unexpectedly, but the script never manages to adequately explain just how the accidental temporal transportation occurred, instead chalking it up to a bad interface between systems. Nonetheless, it does take away from the immediate threat to a modern Earth while sliding into the planet’s history well, in the process giving Adric a fitting farewell as he dashes off the elevator assured that he has cracked the code to save the day. Though the Doctor and the audience know that his attempts are no longer necessary and will, in fact, be in vein, his resolve and ultimate sacrifice end up being incredibly brave and end a troubled character and somewhat uneven story on an effectively somber note that still poignantly resonates.